In recent years substantial progress has been made in the detection of surface phonons owing to considerable improvements in inelastic rare gas scattering tech- niques and electron energy loss spectroscopy. With these methods it has become possible to measure surface vibrations in a wide energy range for all wave vectors in the two-dimensional Brillouin zone and thus to deduce the complete surface phonon dispersion curves. Inelastic atomic beam scattering and electron energy loss spectroscopy have started to play a role in the study of surface phonons similar to the one played by inelastic neutron scattering in the investigation of bulk phonons in the last thirty years. Detailed comparison between experimen- tal results and theoretical studies of inelastic surface scattering and of surface phonons has now become feasible. It is therefore possible to test and to improve the details of interaction models which have been worked out theoretically in the last few decades. 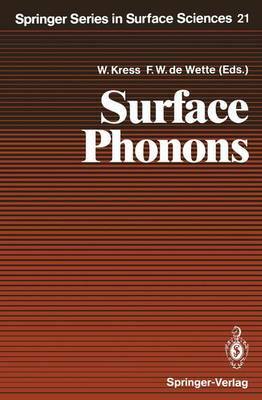 At this point we felt that a concise, coherent and self-contained guide to the rapidly growing field of surface phonons was needed.